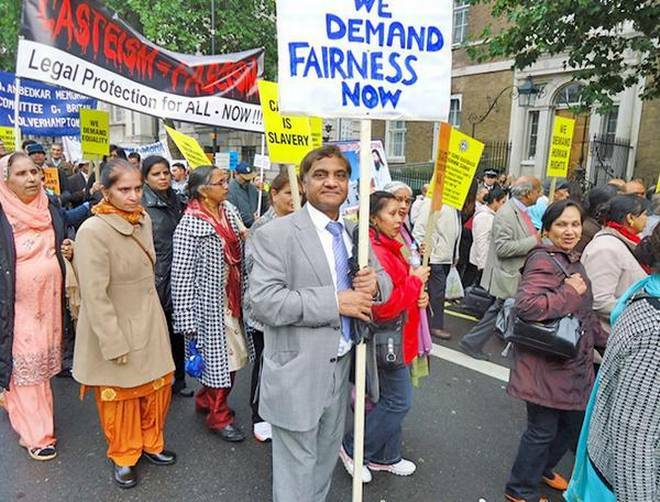 Why is the U.K. thinking of anti-caste law and Why are Hindus against it? Why a caste discrimination law? In June 2009, the first World Conference on Untouchability took place in London. Delegates from across the world gathered to consider how to tackle pervasive and protracted discrimination based on caste or descent. The conference resulted in an ambitious statement aimed at strengthening grassroots movements aimed at eradicating such discrimination and trying to make national legislation more robust. The move, and subsequent testimonies of those who had suffered, caught the eye of U.K. legislators and the House of Lords, in particular, which was already debating issues around equality as the government sought to streamline and simplify Britain’s legislation on equality into one act of Parliament. Thanks to the efforts of a number of members of the House of Lords, including Lord Meghnad Desai, the government was forced to agree to amend the Equality Act. “A Minister of the Crown must by order amend this section so as to provide for caste to be an aspect of race,” reads Section 9 of the Act. The government allowed for further research, and this has proved the decisive factor since. It has taken till 2017 for the government to begin a consultation, despite urgings from the U.N. High Commissioner on Human Rights for it to implement the legislation as soon as possible. The government said while there was “no place” for any form of prejudice and discrimination based on a person’s origins, it wanted to be careful “not to create or entrench any notion of caste consciousness or caste-based practices into British society, which may prove counterproductive or divisive.” A 2014 employment tribunal ruling concluded that caste discrimination could be found unlawful under current law. The government wants to determine whether caste law or legislation is the way ahead. It has proved a highly divisive issue for Britain’s substantial Indian community — covering not just the Hindu communities but Sikh, Christian and other groups too. Those in favour of the legislation, such as Caste Watch UK, the Dalit Solidarity Network and the National Secular Society, are deeply sceptical of the government, believing that a 2010 study commissioned by the government already provided the necessary proof of caste discrimination. They believe bringing in the legislation would not only impact the substantial numbers of people — whose testimony they have heard — who had faced either discrimination or abuse in their schools, work places and beyond (the legislation, however, does not cover the private sphere) but will also help rid the South Asian community of prejudice more widely in the longer term. Why are Hindus against it? Those opposing the legislation, such as the National Council of Hindu Temples and the Hindu Forum of Britain, argue that caste isn’t an entrenched part of Indian society but a product of colonialism and any move to recognise it in legislation would entrench divisions, and deepen prejudice towards Indian communities. It would also lead to unnecessary interference and a bureaucratic nightmare, they argue. What do the political parties say? So emotive is the issue that the political parties by and large avoided it at the recent general election. Labour leader Jeremy Corbyn was previously the chair of the Dalit Solidarity Network but the party didn’t include mention of caste discrimination in its election manifesto (one Hindu group was embroiled in controversy after attempting to persuade the Indian community to vote against Labour during the 2015 election based on this issue). Only the Liberal Democrats have committed to introducing the legislation, though it had opposed it earlier. Where do things head from here? The consultation runs until September, with both camps making a concerted attempt to engage communities across the country in a highly-technical online consultation. While there are fears the consultation and attempts to push the legislation through could get lost in all the Brexit-related political debate, campaigners for it are determined to continue chasing the government, with some prepared to take it to court if need be.